Japanese Episode DP 146: "Pokemon Contest! The Suiren Convention!!" American Episode 1241: "Dressed for Jess Success!" The Suiren Convention draws near! Before the Contest begins, Hikari's training her Mammoo to learn how to get a power up by swallowing its own attack, just like Satoshi's Hayashigame did in its battle with Kurotsugu. Meanwhile, Musashi is too sick to participate, so she convinces Kojirou to disguise himself as Candy Musalina and go in her place. The Contest begins, and Hikari is the first Coordinator to take the stage! As Hikari's Potchama dazzles the audience with a combination of Water Pulse and Bide, Takeshi explains Shin'ou's Super Contests to Kotone and Kazunari. Later, "Candy Musalina" takes the stage and impresses the judges by having "her" Nyasu make ramen using his Fury Swipes attack. The Appeals round comes to a close, and both Hikari and Candy Musalina make it to the second stage! Eventually, Hikari and "Candy Musalina" face off against each other. Hikari attempts to power up her Mammoo, but "Musalina's" Muscippa thwarts the attempt! This sends Mammoo into a rampage that causes it to run wild all over the stage. 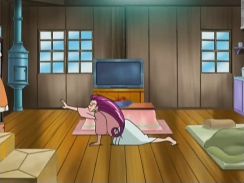 Mammoo's inability to calm down and listen to its trainer's commands cost it the battle, eliminating Hikari from the competition. 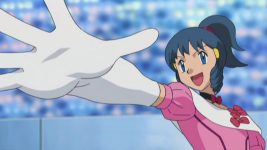 Later, Kotone becomes impressed when she sees Hikari take her loss well and develops a newfound respect for Pokemon Contests. The competition comes to a close, and "Candy Musalina" is awarded the Suiren Ribbon! Now that the Contest is over, our heroes decide to hit the road again for some additional training. After what seems like an eternity, we finally get to Suiren Town. And even though Hikari loses the Contest because her Lizardon Mammoo wouldn't obey her, it doesn't feel like a waste because at least Musashi got to win another ribbon. Before, one could argue that Musashi's wins were just flukes, but now that she has three ribbons, I think it's pretty clear that the writers are going to stick with this long enough to see Musashi make it all the way to the Grand Festival. And that's awesome. One thing that threw me off, at first, was how Kotone and Kazunari didn't really know jack squat about Pokemon Contests. I say "at first" because, after thinking about it, I realized that it actually made sense. Neither Kotone nor Kazunari are Coordinators, and we have no reason to believe that they know any. So even though the Jouto region now has Contests, apparently, why would they have any reason to know about them? Satoshi and Takeshi had to have it explained to them when they went to see their first Contest, so it's not like this kind of thing hasn't happened before. Another thing I liked about this episode is how Momoan comments on Nyasu taking the stage without the use of a Capsule Ball. It's a neat reminder that, hey, Nyasu doesn't really have a Monster Ball and therefore wouldn't be able to use a Capsule Ball in the first place. It's one of those things that you just know, but it's still nice to see the series acknowledge little stuff like that every now and then. The dubbed version dangles that carrot above my head again by keeping all the Japanese music. I want to believe the dub's changed for the better - I really do - but I just know the next episode is going to come along and have replacement music and lame dub cues and crush my spirits. Other than that, I felt that Marion's acting was really, really flat. Has she always been this bad, or do I just not watch the dub enough to remember? 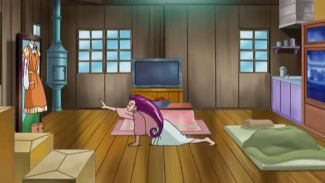 See how you can barely see the dress Jessie is reaching for in the dub? Pathetic. Grandbull and Bangirasu keep their Japanese voices. At the end of the first half of the episode, the music being used - which I'm ashamed to admit I don't remember where it's from - kind of spills over into the eyecatch. It's the kind of thing that happens fairly regularly in the Japanese version. Well, the dub keeps this music, but since they remove the eyecatches, the music just kind of abruptly stops. There's a commercial break there to kind of make things a little less awkward, but if they don't have any sort of break between the first part of the episode and the second part on the DVD, there's going to be this really awkward music skip in the middle of the episode. And yes, I really am scraping the bottom of the barrel to find things to talk about here.